When the weather is warm, we all want to get outdoors to soak up every ounce of sunlight. So what better way to do this than dining on a patio? Oddfellows Liquor Bar opened a patio in the alley space where the original Mikey’s Late Night Slice shack stood. The shack was replaced by a shipping container, so now visitors can enjoy pizza, drinks from Oddfellows, or even a Katalina’s weekend brunch outdoors. 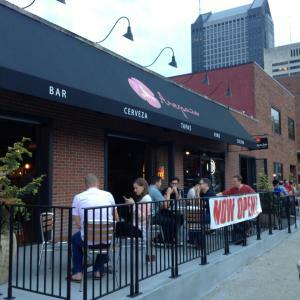 Nada joined the Arena District earlier this year, and already they’ve put their outdoor patio to good use. During the All-Star Game weekend they converted it into a ski lodge. 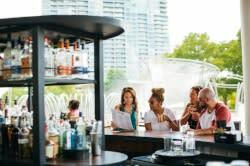 During the spring you can enjoy Mexican dishes and drinks before or after a Clippers game or an event at Nationwide Arena. Condado Tacos lets you build your own tacos to go with margaritas and craft beers. This spring they’re adding an 80-seat patio out back. Coffee outside is a spring pleasure. The new Roosevelt Coffeehouse has a small patio with picnic tables, and the patio outside Hemingway Coffee Nook gives you a view of the Columbus Commons. Some newer restaurants are getting to show off their patios for the first time this season. The Market Italian Village has a small patio for enjoying dinner, drinks, or even brunch. Likewise, Arepazo Latin Grill in the Brewery District has a long patio along High Street. Pop-up Mashita Noodle Bar has a small patio on High Street downtown, too, for weekday lunches. Central Ohio’s new breweries are smart enough to get into the patio game, too. Land-Grant Brewing in Franklinton has a small patio area, and often has food trucks parked nearby so you can grab a bite to go with their brews. Lineage Brewing in Clintonville has a small front patio and garage doors they can open to let the sunlight and fresh air flow. Westerville’s Temperance Row Brewing has a back patio, too. Grab a deli sandwich from Uptown Deli, snag a pint of IPA, then enjoy open air. What are some new patios you’re discovering this season?